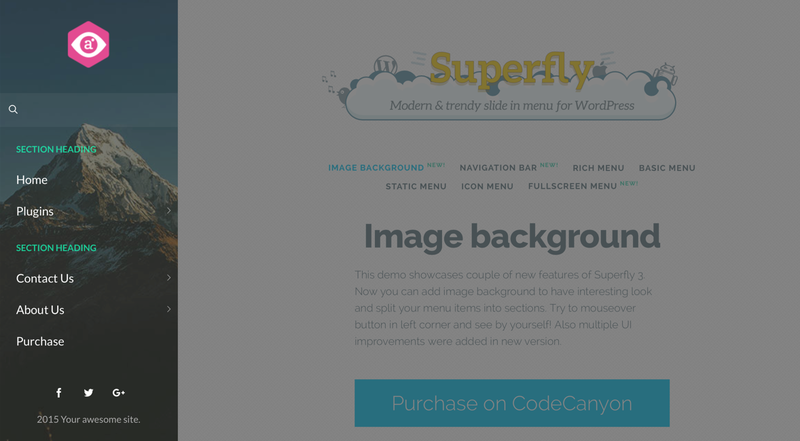 Superfly is a responsive WordPress menu plugin that generates space efficient vertical push/sliding/static navigation, icon toolbar or fullscreen menu on your choice. It can be used as standalone navigation or compliment your main menu. Superfly makes navigation much easier and user-friendly both on desktops and mobiles. Concept of slide in vertical menu that proved itself on mobiles now shines on desktops too! It can be used as always visible navigation as well. Slide in vertical menu is the trendiest flow in web design these days. 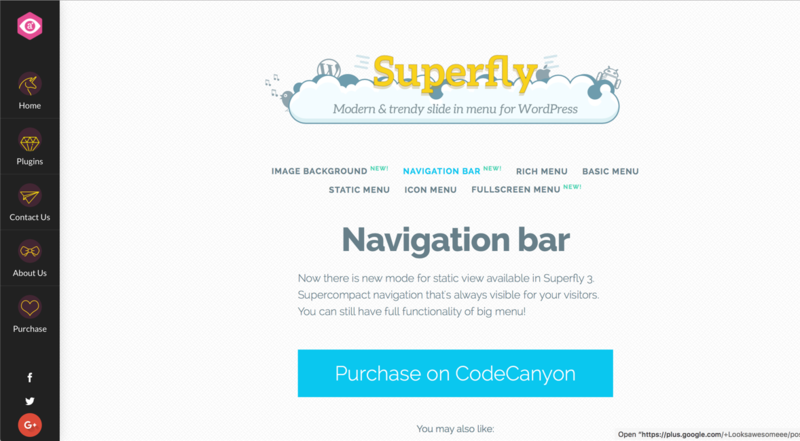 Now this navigation pattern comes to WordPress with Superfly WordPress Menu Plugin. It perfectly suits for every modern site. 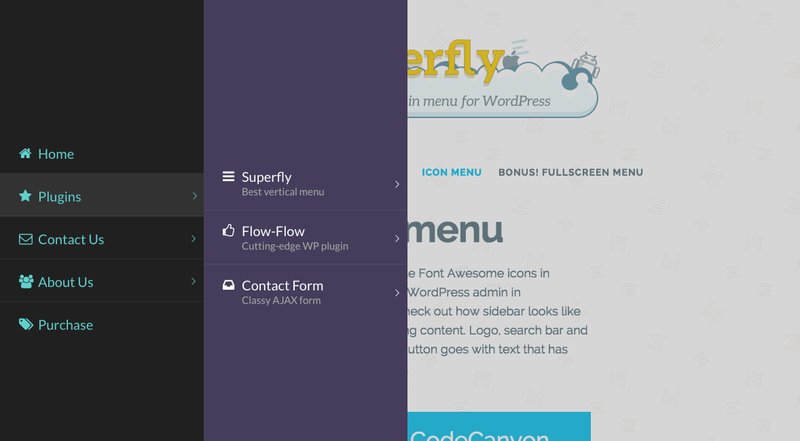 Superfly sits on standard Wordpress menu system. So you create standard WP menu (or use existing) in WP admin on Appearance/Menus page and then you choose this menu on Superfly’s options page as source. 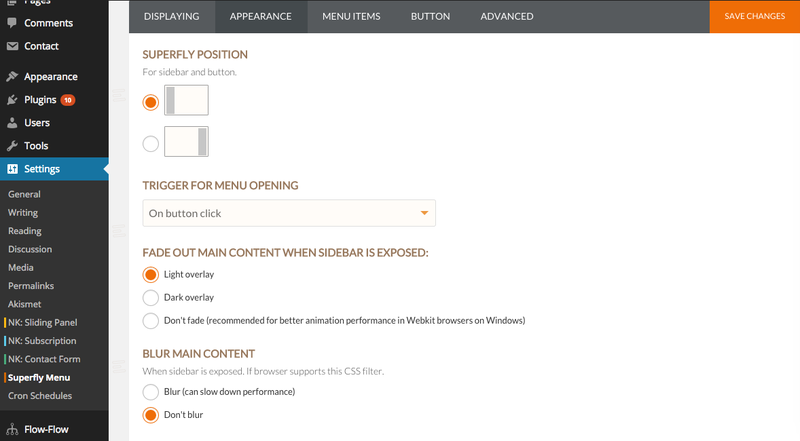 Superfly injects specified menu in its sidebar. Also you have option to specify alternative menu using CSS selector if you want to use some existing menu on page as source for Superfly. Plugin doesn’t replace existing theme menus. In this case y ou should disable default menu in menu locations settings or hide by simple CSS (ask advise for this with your live URL). Various menu modes. Slide in menu, static menu, compact icon navbar, skewed panel, fullscreen mode. GDPR compliant. Plugin doesn’t store any data of your site visitors. 100% Responsive. Superfly suits perfectly to different screen sizes. Displaying control. Show/hide on mobiles, show/hide on desktops, show on specific pages, show for logged in users etc. Content areas. Use rich-text editor to add and style custom content or shortcodes. Trigger settings. Option to hide default menu button (label) and toggle menu from any element like button, link, image etc. Multiple menu sources. Attach to Superfly as much WordPress menus as you need. Google Fonts + settings. Choose font family, size, alignment, line-height, colors and more! Rich elements. Decorate your menu with widgets, shortcodes or any custom html. Styling menu. Design your menu items by adding images, chapters, separators, icons, second row text etc. Change font settings, colors, background image, your logo and more! Multi-level menus support (up to 4 levels). Proper adaptation for both desktop and mobile devices. Menu sections. Group your menu items into logical sections and style it headings. Smooth scroll. Little but great feature especially for one page websites. Get a smooth scrolling to your anchored elements. Label fixed to content. Button can be scrolled with content and its floating is disabled. Icon library. Use pre-installed icon sets or upload your own to style menu items and menu button. Behavior options. Like pushing content or not, opening on hover or click etc. Enhanced mobile support. Use Superfly on all devices or mobile only. You can even add navigation bar with your logo for smartphones. Swipes are supported as well. Rich menu button settings. x,y positioning, base and icon colors, text label, size, custom icon and more! Beautiful animations. 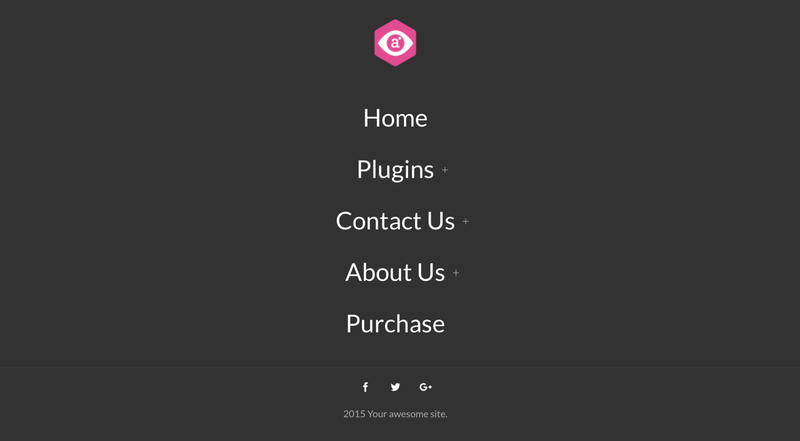 Optimized greatly and created with pure CSS3. Cosy admin panel. Clean design, simple understandable structure and tons of options handy in use. Social bar. Facebook, Twitter, Instagram, Pinterest, Google+, Pinterest, Dribbble, YouTube, Vimeo, SoundCloud, Skype, RSS, e-mail. 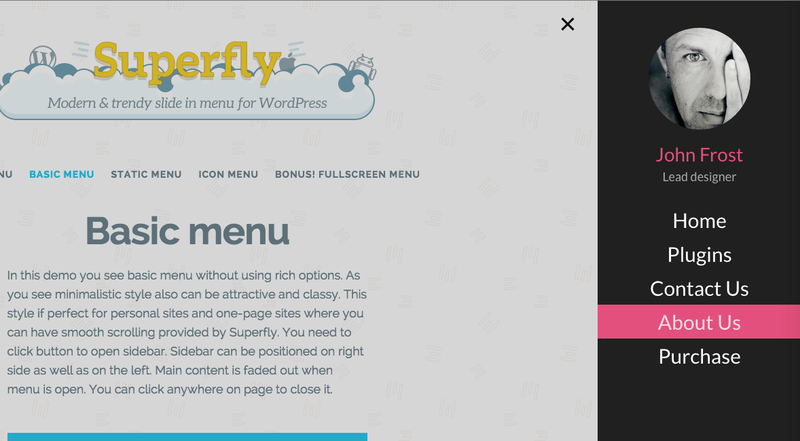 If you like Superfly WordPress Menu Plugin but it lacks important feature you need feel free to request it! Don?t leave silently. We do listen to your suggestions. Any feedback is appreciated. Please fill a very short form below, it takes 1 minute only. Thanks! 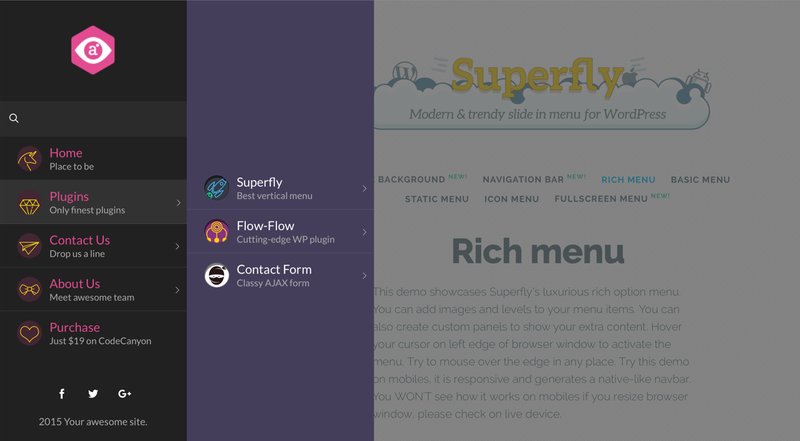 Provide feedback and improve Superfly menu significantly. Please note that Extended License doesn’t allow you to resell our plugin with your theme by default. You have to contact us and get our written permission. Also you may find interesting to learn Offers page on our website. Thanks! [4.0.0] Feature: Multiple Superfly menus per one website. [4.0.0] Feature: New "Skewed" panel design. [4.0.0] Feature: Icon manager tab with icon uploading feature. [4.0.0] Feature: Custom button icon & label. [4.0.0] Feature: Custom icon for any menu item. [4.0.0] Feature: Google Fonts selection. [4.0.0] Feature: New design settings for default hamburger button. [4.0.0] Feature: Horisontal shift for menu button. [4.0.0] Feature: Two additional content areas for menu! Add custom content above & under your logo. [4.0.0] Feature: Rich-Text editor for content areas. [4.0.0] Improvement: More social profiles and contacts in social bar. Pinterest, Dribbble, YouTube, Vimeo, SoundCloud, Skype, RSS, e-mail. [4.0.0] Improvement: Color selection for non-brand icons on social bar e.g. email icon. [4.0.0] Improvement: Admin UI/UX reworked.